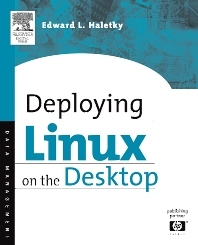 This book will meet the needs of those LINUX users who wish to set up a desktop LINUX workstations, and integrate them into their corporate environment. It will provide practical answers to such questions as: a) What tools do I use to fully integrate with the Microsoft Office tool suite? b) How do I set up my email and interact with a Microsoft Exchange Server? c) Where can I obtain, and how do I install, Internet browser plug-ins needed for web access, media playing, and other corporate Internet functionality? Provides a guide to using LINUX on the desktop for the corporate user. It will cover more than basic topics, such as whether to use OpenOffice or use another tool such as Evolution; they will delve into specific configurations necessary to interact efficiently with the Microsoft centric world of the Desktop. This guide will cover those problem areas that arise and discuss how to smooth over the bumps while meeting the goal of using a LINUX desktop. Lastly this book will cover whether or not a complete LINUX solution is available, or if some hybrid desktop will be needed to interact smoothly in the modern corporate computing environment; including a discussion of necessary LINUX growth directions for future expansion and capability. · Reviews real world requirements. · Covers Pure LINUX, and Hybrid Corporate Desktops. · Covers Enabling Tools such as CrossOver Office and the use of Windows Native programs on LINUX. · Reveals Interoperability Concerns. · Implements a solid Corporate Desktop. · Reviews the complete costs of Implementing LINUX as a desktop. (PRIMARY): This book will also be invaluable to System Administrators and management as they choose which tools to propagate across their workstations. For system administrators, specific packages and tools will be made known; and for management, the ‘for fee’ packages will be outlined with a description of why they would be better or worse than free tools. (SECONDARY): The people who decide to use LINUX as their desktop. Edward L. Haletky graduated from Purdue University in 1988 with a degree in Aeronautical and Astronautical Engineering. Since then, he has worked programming graphics and other low-level libraries on various UNIX platforms. He currently works for Hewlett-Packard in the High Performance Technical Computing Expert Team, dealing with Tru64 and Linux Clustering technologies, as well as general Linux and VMware environments. Edward has also published articles about interoperability, clustering, and security issues for Linux. Assist customers in solving Compaq Tru64 UNIX, and LINUX Operating System, compiler, shell, and application related issues. Assist customers in the programming and maintenance of Sierra and Beowulf Clusters. Created customer tools for information gathering of installed software for Linux and Tru64. Act as a mentor for new employees. Participate in continuing education in the fields LINUX Security, Clustering, tools, desktops, and applications.